Summer has ended and it's time of the year again. Filipino students and young professionals turn to social gaming and video watching during the inevitable dead hours such as one’s daily commute, breaks, and vacant hours. Also, mobile photography is emerging and many night gimmicks should be treasured by photos but most smartphones cannot cope up with the low light environment. Recognizing this need, Asus Zenfone 2 ZE55ML will be the most suitable handheld because of its Pixel Master 2.0 - Unrivaled Low Light Mode. It enhances noise reduction and boosts color contrast by up to 400%, for clear and bright low-light shots with no need for flash. As innovation occurs mobile gaming has already leveled up it’s hardware requirement, no worries! Zenfone 2 is powered by a 64-bit 2.3GHz Super Quad-Core Intel Atom Z3580 processor and it the world's first smartphone with 4GB of dual-channel DDR3 RAM. No problem for low charge too because Zenfone 2 has a Boost charge technology for faster charging! Widget City is standing for their word of the best for less with it's newest offer of PH's first 4GB smartphone, the ASUS Zenfone 2 ZE55ML. We are offering the 4GB + 16GB variant on the Two timer promotion and this offer doesn't harm like the other two timer thing, eh? Just kidding! 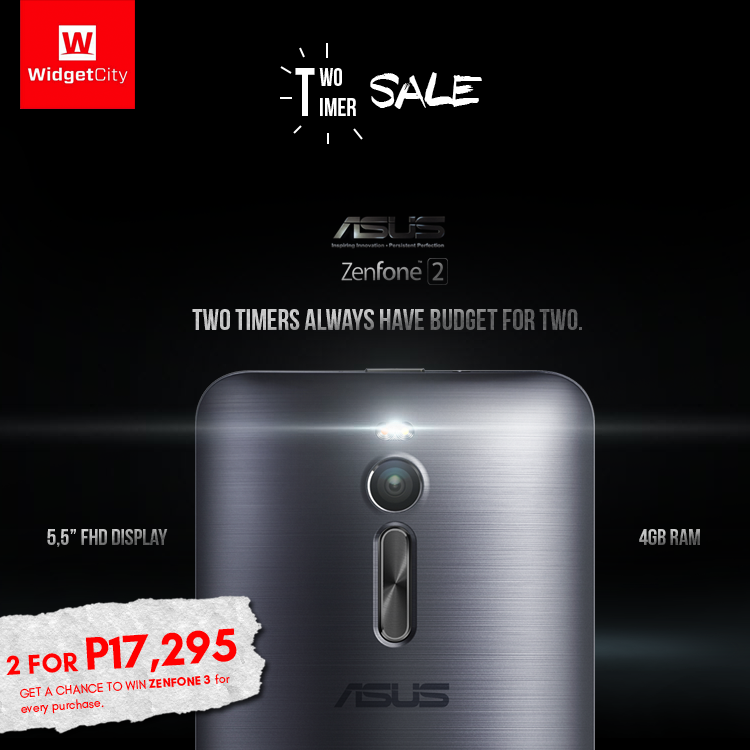 Two timer sale is inclusive of (2) Asus Zenfone 2 ZE55ML 4+16GB at Php 17,295. It will save a big amount of bucks amounting up to PHP9,000 and anyone who purchase the sale will have a chance to win a Zenfone 3 on August when the unit will be released. Sale period will only run from July 1, 2016 - July 30, 2016.